Every day more and more users turn to online shopping. It is quite a hard task to navigate through all the possible deals and offers and DealXplorer offers you a helping hand in this process. But this adware application will provide you with no help, and it will even disturb your online experience. 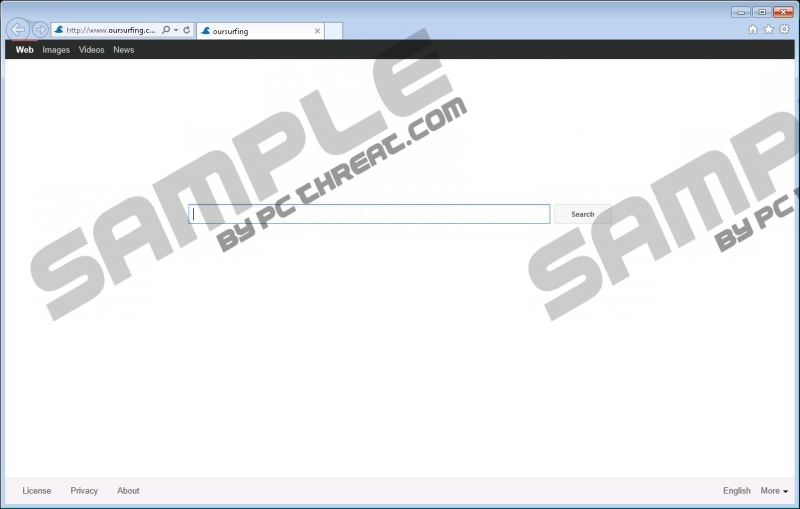 If you keep DealXplorer on your system, you may soon find your browser hijacked, and OurSurfing.com will be set as your default search engine and homepage. We recommend that you remove the unpredictable program before it causes more harm. We need to elaborate more on why we consider DealXplorer a program that should not be kept on a computer of any security-minded user. First of all, this program usually comes unnoticed. Distributors of this adware application try to trick users by placing the program in bundles with other applications. If DealXplorer has managed to enter your system without your knowledge, it means that most likely you are not completely aware what dangers may lie in bundles. Software bundling is a method sometimes used for malware distribution, including viruses and Trojan horses. We can only suggest that you never download anything from unreliable sources and always opt for the Advanced installation mode. This will help you prevent unwanted trespassers from entering your system. The second thing why DealXplorer is not the program anyone should trust is that the creators of this application are closely associated with developers of the OurSurfing.com search engine. Soon after sneaking onto your system, DealXplorer will hijack your browser and make the abovementioned search engine as your default. Your homepage will also be changed. Do not even consider keeping this search engine as it is not trustworthy and even tries to monitor your Internet activity by placing tracking cookies on your device. The same could be said about DealXplorer as well. The application gathers data on your Internet browsing habits with the help of cookies. For example, the program tracks all the things you acquire online in order to display you personally tailored ads. After all, the application could be beneficial to its developers only in case someone clicks on the advertisement generated by DealXplorer. But clicking on those ads will redirect you to third-party websites that could be filled with malicious content. You may find yourself on fake banking, social networking, or gaming pages that are created only to steal your sensitive data. We want to finish on the positive note and tell you that eliminating DealXplorer will not take you much time if you attentively follow our instructions. Restoring your browser settings is a harder task, but our thorough guide will assist you in that process as well. However, you need to increase your security level. Start with purchasing a legitimate antivirus program. Keep it always updated and no dangerous intruders will ever find a way on your system. From our part, we can recommend that you give SpyHunter a try. The latter proved to be a reliable antimalware guard that is able to protect you 24/7. If you need more information on this tool, feel free to contact us via our social media channels. Access the Start menu in the bottom left corner of your screen. Choose Uninstall a program and remove DealXplorer. Open Add or Remove Programs and eliminate DealXplorer. Right-click on the Windows logo. Open Uninstall a program and remove DealXplorer. Go to Search and remove the unwanted search engine. Go to Home Page and restore your default page. Launch your browser and simultaneously press Alt+F. Open Manage search engines… under Search and remove the unwanted one. Go to Open a specific page or set of pages under On startup and click on Set pages. Remove the unwanted page and click OK. Select Show Home button under Appearance. Click on Change, set your preferred homepage and click OK.
Open your browser and simultaneously tap Alt + T to launch Tools. Click on Manage add-ons and select Search Providers. Eliminate the unwanted search engine. Remove the unwanted homepage under General. Quick & tested solution for DealXplorer removal.